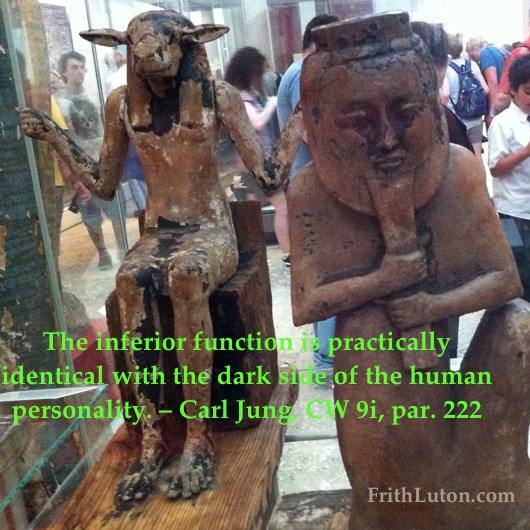 In Jung’s model of typology, the inferior or fourth function is opposite to the superior or primary function. Whether it operates in an introverted or extraverted way, it behaves like an autonomous complex; its activation is marked by affect and it resists integration. The inferior function is always of the same nature, rational or irrational, as the primary function: when thinking is most developed, the other rational function, feeling, is inferior; if sensation is dominant, then intuition, the other irrational function, is the fourth function, and so on. This accords with general experience: the thinker is tripped up by feeling values; the practical sensation type gets into a rut, blind to the possibilities seen by intuition; the feeling type is deaf to logical thinking; and the intuitive, at home in the inner world, runs afoul of concrete reality. One may be aware of the perceptions or judgments associated with the inferior function, but these are generally over-ridden by the superior function. Thinking types, for example, do not give their feelings much weight. Sensation types have intuitions, but they are not motivated by them. Similarly, feeling types brush away disturbing thoughts, and intuitives ignore what is right in front of them. To the extent that a person functions too one-sidedly, the inferior function becomes correspondingly primitive and troublesome. The overly dominant primary function takes energy away from the inferior function, which falls into the unconscious. There it is prone to be activated in an unnatural way, giving rise to infantile desires and other symptoms of imbalance. This is the situation in neurosis. When it becomes desirable or necessary to develop the inferior function, this can only happen gradually. Attempts to assimilate the inferior function are usually accompanied by a deterioration in the primary function. The thinking type can’t write an essay, the sensation type gets lost and forgets appointments, the intuitive loses touch with possibilities, and the feeling type can’t decide what something’s worth. The psychological function that is most differentiated. (Compare inferior function and auxiliary function.) 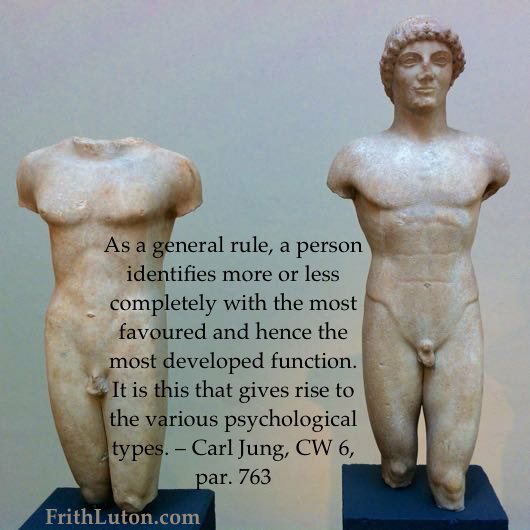 In Jung’s model of typology, the primary or superior function is the one we automatically use because it comes most naturally. In deciding which of the four functions – thinking, feeling, sensation or intuition – is primary, one must closely observe which function is more or less completely under conscious control, and which functions have a haphazard or random character. The superior function (which can manifest in either an introverted or an extraverted way) is always more highly developed than the others, which possess infantile and primitive traits. 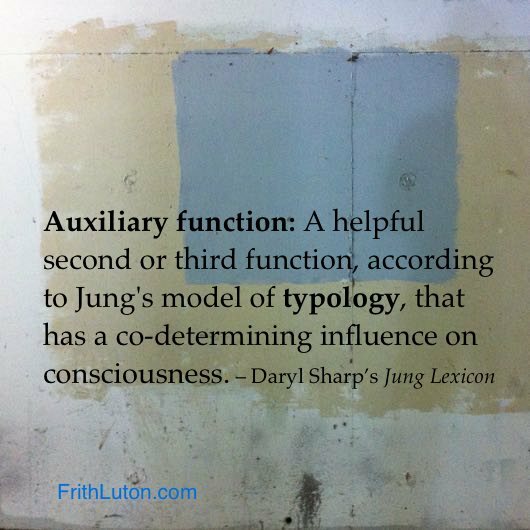 A helpful second or third function, according to Jung’s model of typology, that has a co-determining influence on consciousness. The auxiliary function is always one whose nature differs from, but is not antagonistic to, the superior or primary function: either of the irrational functions (intuition and sensation) can be auxiliary to one of the rational functions (thinking and feeling), and vice versa. Thus thinking and intuition can readily pair, as can thinking and sensation, since the nature of intuition and sensation is not fundamentally opposed to the thinking function. Similarly, sensation can be bolstered by an auxiliary function of thinking or feeling, feeling is aided by sensation or intuition, and intuition goes well with feeling or thinking.